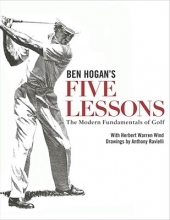 "You can shoot in the 70's " Ben Hogan has long believed that any golfer with average coordination can learn to break 80 if he applies himself intelligently -- and here, with Herbert Warren Wind, and artist Anthony Ravielli, he tells you, step by step, just how to go about it. The greatest golfer of our generation has distilled his experience as teacher, player, and observer of golf into a series of richly illustrated "visual instructions" that not only can improve your game and lower your score, but also can help you get even more fun out of what many people already think is the most enjoyable game in the world. Each chapter, each tested "fundamental" is explained and demonstrated with amazing detail and clarity. It's as though the master himself were right there at your elbow, giving you a personal lesson with the same thought and care that has gone into his lifetime of golf. "The Modern Fundamentals of Golf" is no instant and easy shortcut. There is none. But with Ben Hogan as your pro, you can master these basic movements very quickly. And then you can go on to develop a correct, powerful swing that will repeat. As Ben Hogan says, it's only then that you'll "discover golf for the first time."